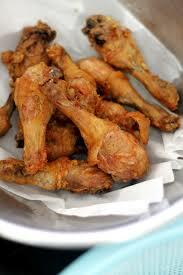 Borrowed photo: We all know our chicken legs are much meatier than these! lol! Simple cooking is like back to basics. I rely on flavor of the meats instead of a counter full of seasonings. Call me old fashioned, but this recipe makes my chicken POP! rub all dry ingredients on your chicken. Place grease in the fry pan, then chicken skin side down. turn pan to medium low. Cover and let simmer for about 15 minutes. I will check it once so skin doesn’t get stuck to pan. after the first 15 min. flip the chicken over and turn down 1 notch. let simmer for 10 more minutes. then check and see if meat is cooked thru. thinner cuts may cook faster, most of my chicken parts need all this time to get done. Serve over your favorite veggies or rice, potatoes, or even noodles. Use the left overs in the pan to make rue and gravy, or save for adding to rice or other to flavor it like you would use a bouillon. If you like you can wrap chicken in bacon also. As another variation. Battering the parts is easy, and can be done the same way as above. just add some flour or almond flour. Use a spicy sauce if you like a little kick once in a while.